Drive Angry has more bloodshed than action or acting. The movie is for those who like this kind of thing, and is mildly exciting if you're in the mood for unadulterated gore. Plus, watching a tired Nicholas Cage go about his business of looking, well, tired, is a fringe benefit. The plot goes like this. The taciturn ex-criminal Milton (Nicolas Cage), preoccupied with thoughts of revenge, drives through the countryside to get back at the meanies who brutally killed his daughter and took away his infant grandchild. A strange man (Willaim Fichtner) who calls himself The Accountant - and who has superhuman strength that helps him brutally mutilate people who try to speak up to him - follows his trail. Turns out that Milton's daughter was earlier tricked into joining an eerie cult headed by the Voldemort-like Jonah King (Billy Burke). King has plans of sacrificing the baby in a ritual in a place called Stillwater. What Jonah King's cult is is never really clear, and it would have been logical to have had it explained in greater detail. The climax springs some supernatural references onto you, which is baffling since the rest of the story moves on a completely different plane. The result is an odd Twilight-meets-conventional-action-flick mish-mash that rarely impresses. However, to the film's credit, you don't really notice the obscurity of the plot (or even that there is one in the first place). You broadly understand that Milton is on a vengeful hunt for his enemies, and that he in turn is being followed by a dangerous entity - and this is enough to sustain the moderate level of interest that the chases and the quick sequencing of events generate. Nicolas Cage looks beat and bored. Billy Burke doesn't have much to do. Amber Heard is an accessory, but she gets to wield the gun at times. William Fichtner, as the unearthly weirdo who follows Milton and keeps wiping out opponents with a permanent calculative smile plastered on his face, puts in the only interesting performance in the flick. The 3D works in a few riveting action scenes, when the metal shards and bullets (and the bits of flesh) keep flying all over. The technology is pretty irrelevant to your experience during the rest of the flick. 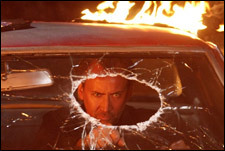 You may watch Drive Angry if you're in the mood for some brief insanity powered by exploding cars and humans, but we're sure you have better options this week. Be the first to comment on Drive Angry - 3D (Hindi)! Just use the simple form below. fullhyd.com has 700,000+ monthly visits. Tell Hyderabad what you feel about Drive Angry - 3D (Hindi)!